Buddy’s discovering that plain fur is just so yesterday. 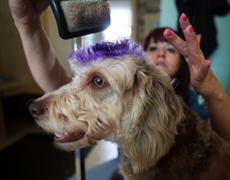 Read up on the dog salon movement that’s going beyond the traditional poodle pouf to include Mohawks and more. More people seem to be dolling up their pooches, according to a story by the Associated Press, and spending billions doing it. The latest examples, a dog with a purple mohawk and others getting lavendar infused oil therapies to calm their weary souls. Over the top? This entry was posted on Monday, April 18th, 2011 at 11:15 AM. It is filed under Blog. You can follow any responses to this entry through the RSS 2.0 feed.